A cathedral, from the viewpoint of the church hierarchy, is merely the seat of a bishop, his cathedra, supported by the members of the cathedral's Chapter. Hence, prime movers in the construction of Gothic cathedrals were the powerful bishops of France, men who mediated between Rome and the French kings. 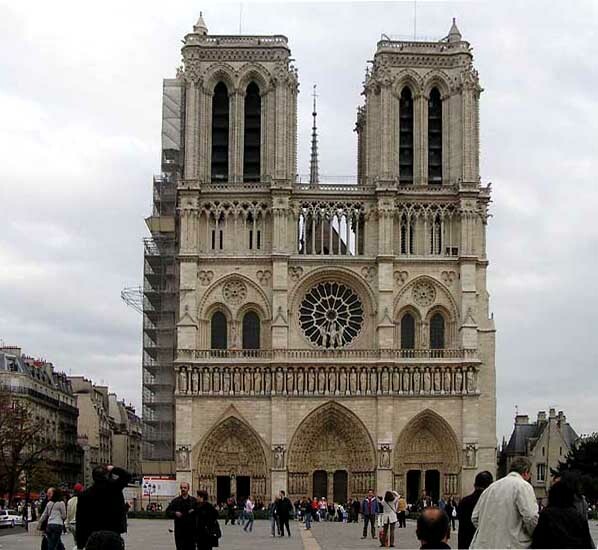 A blessed convergence in twelfth-century France produced the Gothic Cathedral, one of the greatest achievements in the field of architecture. Beginning with modest, but substantial, modification of the Romanesque style, the cathedrals of the Early Gothic period - the twelfth century - evolved triumphantly into the High Gothic structures of the thirteenth, and the impassioned churches of the Rayonnant and the Flamboyant styles of the fifteenth and sixteenth centuries. No structural style has spread as rapidly and as widely as Gothic. Twenty-five cathedrals were built between 1130 and 1230, within 100 miles of Paris; and 80 cathedrals and 500 abbeys were built in 90 years from 1180 to 1270 under three Capetian kings: Louis VIII (1187-1226), his father, and his son. 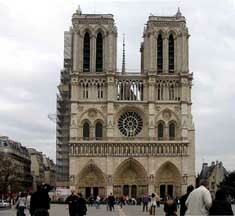 Gothic structures sprouted throughout England, Spain, Germany, and Belgium, and the influence of French Gothic rolled outward through the Christian world under King Louis IX (Saint Louis, 1226-1270) to be blocked only in Italy, south of Milan, by the Renaissance and in Greece by the Byzantine tradition. The Romanesque cathedrals had been massive, dark structures, where pious men of the Middle Ages hid in fear and looked for God. The Gothic cathedrals, conversely, opened themselves to the light of the outer world, transforming it, making it unearthly. They appeared transparent and diaphanous. Their unfathomable height expressed the aspiration of humanity toward a God to be loved and sought in the nave by the light of day, as well as in the penumbra of the candlelit chapels. On the other hand, the magnificence of the statuary and the monumentality of the structure in Gothic cathedrals were signs of a new well being, a prosperity that allowed much of the worldly goods to be spent for spiritual purposes. This luxury could only have been amassed through a new social organization. The Capetian kings of France, by subtle guile and raw power, overcame at last the predominance of the small feudal lords, and thereby concentrated power in the court, extending it over nearly the whole of France. Cities and towns flourished under the new system, commerce expanded greatly - both internally and externally - and a new type of man emerged, freed from serfdom to the local master and allowed to substitute money payments for personal services to the king. The University of Paris, second oldest in the world, opened in 1200 and the cathedral schools took over from the monasteries the responsibility for education and the spreading of new ideas. 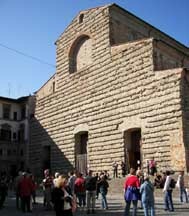 While Romanesque churches are usually covered by trussed, wooden roofs or stone barrel vaults. which do not permit large window openings, the aisles, nave, transept, choir [that part of a church between the sanctuary and the nave reserved for singers and clergy - atypical in American churches because the choir is often is seated in a raised choir loft], and chevet bays [an apse having a surrounding ambulatory] of a Gothic cathedral are all covered by masonry vaults. [A] vault's weight] thrusts out the piers. There are two ways of resisting these outward thrusts: by inserting tie-rods ... or by supporting laterally the top of the piers by means of buttressing elements. The Gothic masters rejected the first solution as a permanent solution for both aesthetic and practical reasons. Tie-rods across piers would have ruined, visually, the vault-defined spaces, and their rusting ( even if they were covered with lead), might, in time, have cracked the masonry in which they had to be anchored. Therefore, the first preoccupation of the masters was to reduce the magnitude of these thrusts. 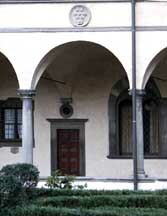 They had little knowledge of structural theory, but experience had shown them that pointed arches thrust out less than circular arches. The main difference between Romanesque and Gothic arches lies in the pointed shape of the latter, which, besides introducing a new aesthetic dimension, has the important consequence of reducing the arch thrusts by as much as fifty percent. 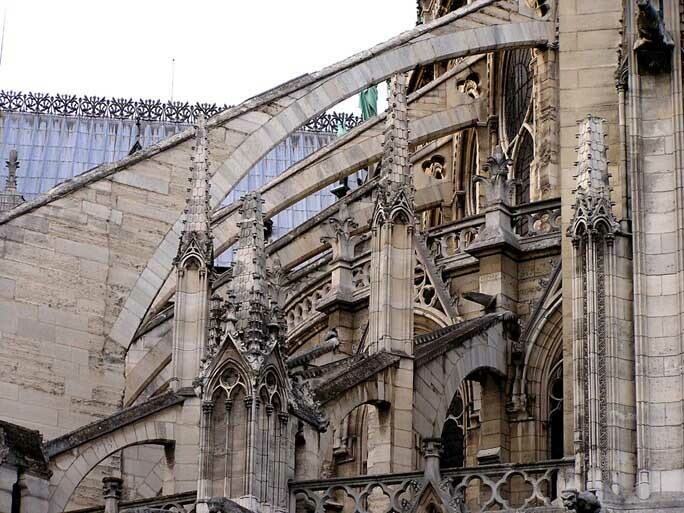 Since the piers would bend under the action of the thrusts and, possibly, buckle under the action of the vertical loads, the groined vaults, although ribbed, had to be buttressed. Here again two solutions were available to the masters: internal buttresses, or buttressing elements external to the church. There is no question that the first solution would have frustrated the goal of creating a single, open, high, lighted inner space. It was rejected. 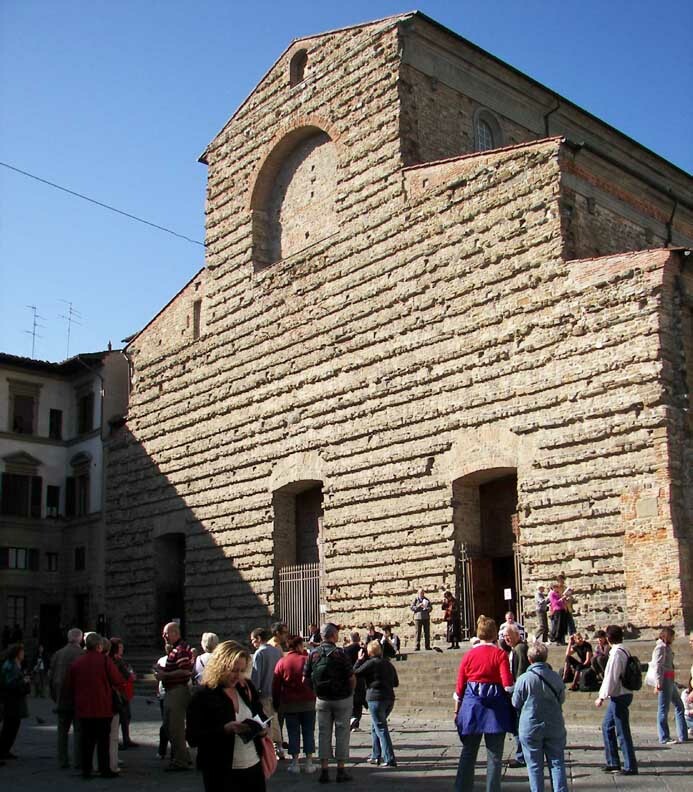 Instead, the vaults were buttressed by means of wall-like pillars set outside the church, which at first were attached to its walls and acted as external "shear walls." The interior of the cathedral thus remained linearly pure–its space uncluttered by intersecting structural elements–while the exterior became cluttered with a magnificent forest of vertical pillars andflying buttresses.